There’s no getting around it, moving your loved one to assisted living can be challenging— for everyone. That’s not to discount the tremendous benefits you’ll experience. As with any major life change, there may be some trepidation and uncertainty. But there’s also a lot to look forward to in an assisted living community in Florida, and a number of ways to create a smooth move for your loved one and you. Getting to know the community before move-in day can go a long way in helping you and your loved one feel more comfortable with your decision. First, you can arrange an in-home visit from the assisted living community in which a Sonata staff member will get to know your loved one, learn their needs, likes, interests, and answer any questions you may have. Even though you’ve likely already visited at least once when deciding on the right community, you shouldn’t stop there. Visit the community often with your loved one to have a meal, participate in activities and get to know the staff as well as their new neighbors. Provides the option for couples to stay together as the care needs of a spouse change. while the loved one is being cared for. Enjoy special time with your spouse without the worries of being the caregiver. They may actually have more independence – Assisted living communities in Florida provide just the right amount of support and assistance to help your loved one live life to its fullest. A worry-free lifestyle – Your loved one will enjoy spacious accommodations and amenities, some of which also offer a pool, fitness center, restaurant-style dining, home maintenance, housekeeping and laundry services. 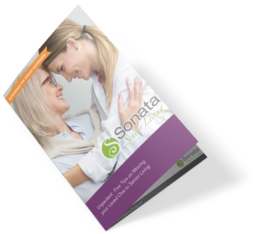 Active living – Sonata communities offer monthly calendars filled with fun activities, clubs, classes, events and outings. This provides great opportunities for socializing, exercising and staying mentally active. 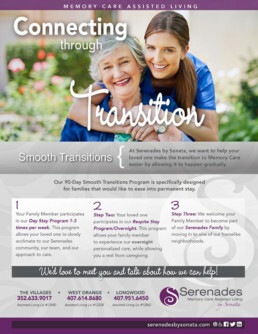 Peace of mind – In a Sonata assisted living community in Florida, your loved one will have help available 24-hours a day in an environment designed specifically for those with limited mobility so it may be even safer and more secure than home. One of the first things you should do on moving day is to set up your loved one’s space so it feels like home. Arrange photos, keepsakes, furniture and personal items so it feels comfortable and familiar. In most cases, you’ll be downsizing, so full furniture sets may not fit, but ask the community for a copy of the floor plan to see what favorite pieces and accent pieces will work. You can help build quick rapport between your loved one and those who’ll be caring for them by making their personal preferences known to the staff. Whether it’s favorite snacks, favorite books and music or even that you’re loved one is a night owl or that they hate the smell of coconut; this gives the staff a way to connect and help your loved one feel understood and at ease. And who knows what they may find in common? For many, one of the hardest parts of moving to a new community is finding a way to fit in. Luckily, assisted living communities in Florida typically have new resident ambassadors (or some type of buddy system) to help your loved one through their first days. Check with the community about this, if they don’t mention it first! Typically your loved one will be paired with a person or persons who share similar interests or backgrounds to show them the ropes and help them feel welcome. You may be surprised at how quickly new friendships begin. Keep in mind, these residents have been where your loved one is and may also have some tips that helped them when they first moved. Sometimes loved ones worry about being left behind when moving to an assisted living community. To make sure your loved one knows that’s not the case, get a calendar and write down the days and times you’ll call (or Skype) and visit. Perhaps you always had lunch together on Sundays; you can still do that! And have other family members and friends do the same. This will give your loved one plenty to look forward to and help them feel reassured.